There are two solutions to enable or disable Windows 8 and 8.1 password query, when resuming from sleep mode! 1. Directly to disable or enable the password prompt in Windows 8 at wake up from sleep! then appears the option for entering the password on wakeup (... See Image-2). 2. Indirectly to disable or enable the password prompt in Win-8 on wake up from sleep mode! Start the Windows 8.1/8 "Control Panel" and then open the Win-8 "Power Options". In the Power Options, click on the text "Require password on wakeup" (... See Image-1 Arrow-1). .... How can I change or remove the Windows 8 user password? See also: .... Windows 8 automatically login to your user account? HOT-TIP: ... an alternative to the standard Windows Run-Dialog. (Image-1) Windows-8 Requiere password on wake up! 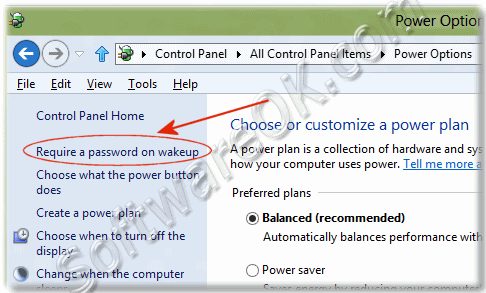 (Image-2) Windows-8 Password protection on wake up! When your computer wakes up from sleep, no one can access your data without entering the correct password to unlock the computer. When your computer wakes up from sleep, anyone can access your data because the computer isn't locked. Windows-8 - FAQ-31: How to enable or disable Windows 8 password query when resuming from sleep mode? Shut off windows 8.1 password? Password after hibernation windows 8, remove sleep password windows 8? Disabling password protected when sleep mode? How to unlock sleep mode on computer 2013? Windows 8.1 disable password login from sleep, remove password unlocking computer windows 8? Windows 8.1 no login sleep? How to turn off auto password change windows 8? Disable password prompt on windows 8? How to remove password on win8 resume? How to remove password on wake in windows 8, windows 8.1 disable password sleep? How to disable login on windows 8.1 after stand by? How do i take the password off my windows 8.1 computer? How do i turn off the password on my windows 8.1 computer? Windows 8.1 suspend boots into locked screen? How to inable password login in win8? Stop assword request in win8? No password on sleep windows8, windows 8.1 will not prompt password on wakeup? Windows 8.1 disable password after sleep or don't windows 8.1 asks for password after hybernation? Windows 8.1 password when computer goes to sleep? Windows 8.1 wachtwoord na slaapstand? How to remove the microsoft password in windows 8.1 using command prompt? Windows 8.1 auto login after sleep? Disable windows 8.1 boot password? Win8 disable wakeup password API? How do i remove password protection from windows 8.1 when my computer goes into sleep mode? Remove password off windows 8, no password promt after hibernation windows 8? How to remove password on sleep restart windows 8, disable password to wake up windows 8? How to disable desktop password in windowss 8? Windows 8.1 login screen after hibernation? How do i remove the password for guest in Windows 8? Which window on control panel is used to require a windows password to wake a sleeping computer? How to enable sound on computer after disabling forwindows 8? Windows 8.1 how to turn off password protection? Turn off password windows 8.1 sleep or windows 8.1 hibernate password? Windows 8.1 disable login on resume? Windows 8.1 how to disable password login after sleep? Unable to eliminate need for password in windows 8? How can you avoid a password in windows 8.1 after sleep mode? Windows 8.1 with safe pass disable? Turn off password in windows 8? Windows 8.1 power saver mode password portected? Windows 8.1 remove password after sleep or commandline password on wakeup? Windows 8.1 sleep password, windows 8.1 disable password after standby? Remove windows 8.1 standby password? Windows 8.1 remove sleep password, windows 8.1 power options wakeup password? Command line don't require password when system wakes from sleep? How to eliminate standby password in windows 8? Windows 8.1 bitlocker automatic login after hibernate? Tired of putting in my windows 8.1 password? How to bypass hibernate password on windows 8? How to disable password in windows 8, how to disable password request after suspend in win 8? Turn off password after hibernate windwos 8, windows 8.1 prevent password sleep? 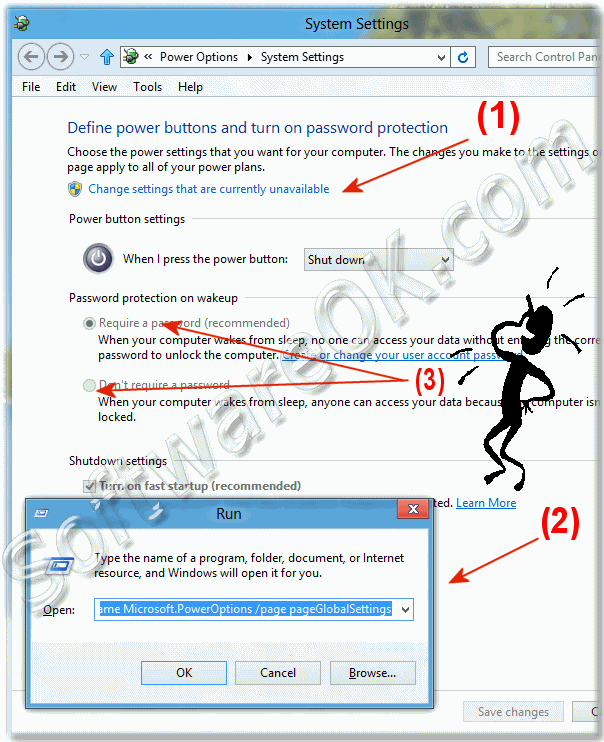 How to disable password on win 8.1 wake up, how to remove require a password on windows 8? Skip password windows 8.1 resume? No password windows 8.1 wake? How do I remove password on sleep from start up windows 8? Windows8 disable password on resume? Avoid password when switching user on windows 8? Turn off asking password in windows 8.1 when hibernation? How do you turn off programs that require a password in windows 8? How to Disable windows 8.1 Password on Wake up from Sleep? Windows 8.1 disable login screen after sleep, disable password windows 8? Sleep off but wiindows requires password? Win 8.1 turn off password? Bypass password after windows 8.1 sleeps? Turning the password on in windows 8? How to enable pc password windows 8? Windows 8.1 no password after hibernate? How to remove password off windows 8, remove password windows 8.1 sleep? How to take password protection off windows 8? HOW TO REMOVE windoes8 startup page passwords? Activate password on windows 8? Windows 8.1 password after sleep enable? Windows 8.1 password on resume? Windows 8.1 sleep mode password, windows 8.1 turn off password from sleep? Windows 8.1 password protection, turn off password when comes out of sleep windows 8? How to unpassword protect computer windows 8? Windows 8.1 set to not need password after sleep? Windows 8.1 require password from sleep? How to get rid of need for password on windows 8.1 waking up? Windows 8.1 No Password Sleep? How to remove windows 8.1 password from sleep, restore from sleep windows 8? Turn on strt up password-windows 9? How to set to ask for a password when windows 8.1 is put in sleep mode? Password on wakeup grayed out windows 8? Whens computer is in sleep mode on windows 8.1 how do you get it back on? Push one key to turn windows 8.1 to sleep mode, windows 8.1 password resume from sleep? Windows 8.1 remove password check after suspend? Windows 8.1 ask me password? Prevent windows 8.1 asking for password after sleep? Remove password after resuming from sleep? How to get rid of password on windows 8.1 during wake? Windows 8.1 disable password request? Why does resetting windows 8.1 take so long? Eindows 8.1 password protection on software installations, how to remove password after sleep windows 8? Windows 8.1 return from sleep password? Windows 8, turn off password from sleep? Windows 8.1 screen sleep password? How to unlock windows 8.1 computer from sleeping? Windows 8.1 skip login screen after sleep? Windows 8.1 no password after sleep? How to disable password windows 8.1 sleep? Wake from sleep no signin windows 8, windows 8.1 sleep password disable? Win 8n how to stop using password to open program? How to eliminate password after sleep windows 8, remove pw after sleep win 8? Prevent signing on after sleep windows 8? Remove password windows 8, how to disable off password protection for windows 8? Windows 8.1 password from hybernate? W8 ask for password after hibernation? No password after sleep windows 8? How to enable password in windows 8? Remove password on windows 8? How to turn off password on windows 8? Ask for password after hibernation windows 8, tat pass word sleep window 8? Windows 8.1 password protect on hibernation mode? Remove password options windows 8? How do i turn off my password on wake for windows 8? Want to remove the password when it comes from the Sleep mode? How to remove sleepmode password in windows 8, disable password on win8? How to remove windows rt password through command prompt? I can't get wake up to require password windows 8? How to disable windows password wake up? How to remove password protection in windows 8? Password protection windows 8.1 uninstall? To turn off password protection after sleep mode in a windows8? Turn off password windows 8? When I on my PC after booting is displays log on to windows dialog box request user name and password how do i disable it? Windows 8.1 password protection on wakeup grayed out? Disable resume from standby password command prompt? Windows 8.1 disable password after sleep? How to remove password windows 8.1 sleep mode? How to remove acces password on windows 8? Require a password when a computer wakes progame? Why the password come again in window 8? Windows 8.1 policy security exchange password wake? How to stop password request on windows 8? How to top password windows8? Password protection on wakeup greyed out windows 8? Disablke windows 8.1 asking for password? How to stop windows 8.1 puting in password? Dont want to put in password in windows 8.1 when booting up? How do you remove a password sign on on windows 8.1 when it boots up? Password after hibernate windows 8? Win 8.1 hibernate without locking computer? Windows 8.1 kennwort standby, turn off passwords user accounts windows 8? Windows 8.1 remove password after sleep, remove password when unlock windows 8? How to let windows 8.1 dont ask for password? Permanently remove password from windows 8.1 login? Delete password requirement after restart with windows? Windows 8.1 why does it lock when it going to sleep and need my password? Windows 8.1 password standby remove? Windows 8.1 unlock after wake up? How to turn off sleep password on windows 8? How to remove password from password protected laptop windows 8? Windows 8.1 disable lock out? Windows 8.1 lock on sleep? Password does not work after sleep in windows 8? How to turn off password login on Windows 8.1 after sleep? How to show login screen each time after sleep mode in windows 8? How do i stop windows 8.1 from asking for password when i turn on computer? Windows 8.1 remove password after sleep? Windows 8.1 turnoff password after sleep? Win 8.1 password sleep, Require password from sleeping win 8, how to disable password prompt in windows 8? Why does windows 8.1 ask for a password for networking after it goes to sleep? Windows 8, remove password after sleep, password after suspend windows 8? How do i turn off my password on my windows 8? How to turn off password on sleep? Windows 8.1 disable require password on wakeup greyed out? How to disable password request after suspend in win 8? How do i set windows 8.1 to require password after sleep mode? Remove the password prompt after standby windows 8, windows 8.1 turn off password prompt? How to turn off password on windows 8, windows 8.1 disable unlock password? Turn off password after sleep windows 8, turn off windows 8.1 sign in after sleep mode? Grayed out on resume display logon screen windows 8? Turn off password after sleep windows 8? Windows 8.1 log in it goes to sleep mode and i have to log in again? Turn off requiring password in windows 8? Booting into windows8 from sleep without password? Password on wake hibernate windows 8, how to turn of the password on windows 8? Locked out of windows 8.1 after sleepmode, delete password off windows 8?